Malaysia is becoming the poster-child for the crisis in emerging markets. The rising tensions between the people and government are clearly demonstrated by this story developing within the emerging markets. In Malaysia, we hear the central bank is recommending criminal prosecution in connection with the controversial investment fund 1MDB, the BBC reported. 1MDB was a sovereign wealth fund that was set up by Malaysian Prime Minister Najib Razak. The fund invested nearly $1.83bn abroad without using proper procedures. The investment bank Goldman Sachs is at the center of the criminal investigation in Malaysia since it organized 1MDB to raise U.S. dollar debt to finance acquisitions of power plants. Goldman Sachs also did the currency swap from dollars. Goldman Sachs’ role has been highly criticized in the Malaysian media and political circles after it emerged that 1MDB paid hundreds of millions of dollars to the bank for helping it raise $6.5 billion in three bond deals in 2012 and 2013. Goldman Sachs earned around $590 million in fees plus commissions and expenses from underwriting the bonds, according to Reuters. The reported fees are highly excessive, nearing 10%, when such fees are typically only 1% in bond underwriting. The Wall Street Journal reported last July that investigators looking into 1MDB had discovered nearly $700 million transferred to Najib’s bank accounts. Malaysian Prime Minister Najib Razak also acts as finance minister in Malaysia and on top of that chairs 1MDB’s advisory board. Malaysia’s anti-corruption commission said the funds deposited in Najib’s accounts were from a donation, not from 1MDB. However, they declined to reveal who the donor was and for what reason they donated. Then this financial mess gets even more convoluted. Abu Dhabi is in the mix through IPIC established in the 1980s to focus on energy investments. For some strange reason, they have been a supporter of Malaysia as part of its expansion to developing countries and have already offered financial support. An Abu Dhabi government-owned investment firm revealed that it would pay $102.7 million (U.S. dollars) in interest payments due this month, in addition to paying for two $1.75 billion bonds next month that were issued by 1MDB units and are co-guaranteed by IPIC. 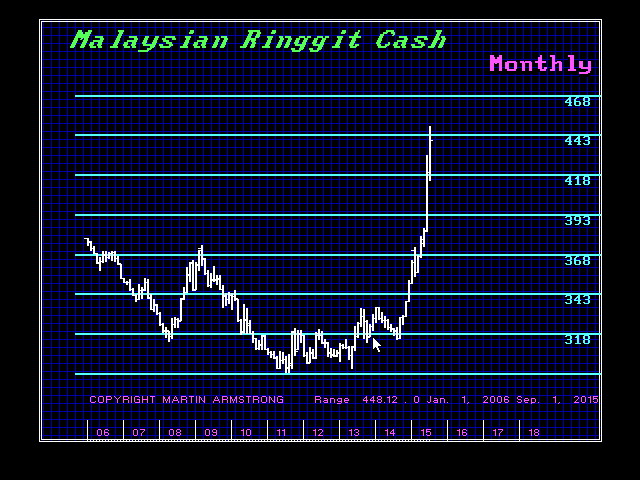 Growing pressures of this corruption scandal are clearly demonstrated in the depreciation of the Malaysian Ringgit over the past few months, as illustrated above. However, this is at the heart of emerging market debt that is going to explode with a rising dollar. The total debt, which rose after 2007 in dollars, is nearly 50% of the total U.S. national debt without the economic infrastructure to support it. This corruption scandal is starting to make worldwide press with the turn in the ECM on 2015.75.